Revisited. Last tried in 2005 the wine was young and tannic. 10 years later it has smoothed. Dark black with a tawny edge. Aromas of red berries, chocolate and spice. Flavors of dark blackberry, cedar and raspberry. Along truffle and chocolate finish. 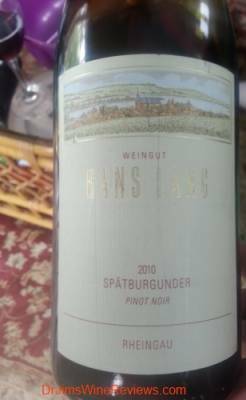 Hans Lang Pinot Noir was imported to Germany by monks years ago from Burgundy. Light red in color. Very floral and a little toast. Fresh berries, raspberries, smooth and sweet aftertaste. Mild body. 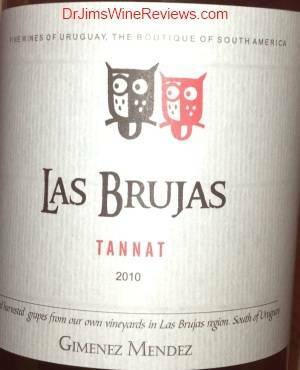 Red Wine: Las Brujas Tannat, 2010, Uruguay. This wine is made from 100% Tannat grape from the Las Brujas (the witches) region of southern Uruguay. This grape originates in the Basque regions of France. The nose is of raspberry and grape. It has a tannic taste that is reminiscent of port with fruit and blackberry notes. 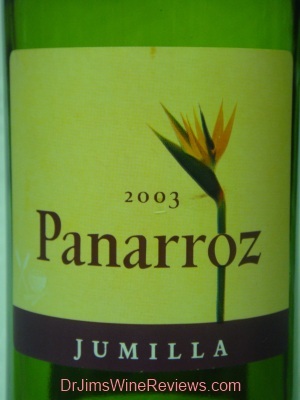 Red Wine: Panarroz Jumilia, 2003, Spain. A medium red wine with a nose of stewed fruit with a taste of mild fruit, cherries and raspberry. Soft finish. 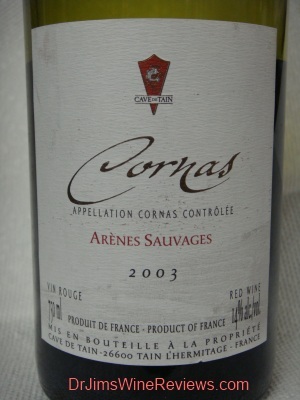 Red Wine: Cornas Arenes Sauvages, 2003, Rhone, France. Cornas is 100% syrah made from old vines on property in the northern Rhone Valley. It undergoes a long maceration and is fermented 18 months in oak. It is black in color with aromas of raspberries, fruit and oak. Smooth and well rounded mouth of fruit and cassis with a supple long peppery finish. Truely a good Cornas. Would be great with meat or stronger cheeses.